Morris Brown has had a bit of a time since its founding. In fact, the school, established in 1881—one of only a handful of HBCUs founded by African Americans—has had some serious struggles in recent years. The college has filed for bankruptcy its once flush enrollment of 2,700 students in 2003 has dwindled to fewer than 20. And yet the college that could has persevered. It emerged from bankruptcy; it recently received a $900,000 grant that will help prevent HIV in young African-American adults; and it just graduated its class of 2016. 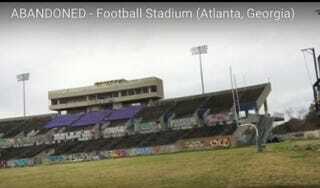 But be clear, the school still is but a wisp of its past; this can be seen most visibly through a recently released video showing the effects of abandonment to the once-glorious Herndon Stadium, the 15,000-seat former home of the Morris Brown Wolverines. Herndon is now littered with trash, graffitied all over, and overrun with weeds. Morris Brown no longer has an athletic program, and the stadium is no longer owned by the college. Watch an insiders look at the stadium via GrimmLifeCollective below.